300s B.C. The Greek Aristotle was the first to observe and describe how he saw a light after-effect: a persistent image (that slowly faded away) after he gazed into the sun. 65 B.C. The Roman poet and philosopher Titus Lucretius Carus described the principle of persistence of vision - the optical effect of continuous motion produced when a series of sequential images were displayed, with each image lasting only momentarily. 130 A.D. The Greek astronomer and geographer Ptolemy of Alexandria discovered (and proved) Lucretius' principle of persistence of vision. late 1790s Belgian optician and showman Etienne Gaspard Robertson's Phantasmagoria - a kind of amusement 'horror show' designed to frighten audiences that became popular in Europe. He produced the show with a 'magic lantern' on wheels (which he called a Phantascope or Fantascope), usually out of view of the audience, to project ghostly-looking, illusory images that changed shape and size, onto smoke or onto a translucent screen. 1820s The Frenchman Peter Mark Roget (famed as the author of Roget's Thesaurus) rediscovered the persistence of vision principle. 1834 William George Horner invented the first zoetrope (which he called a daedalum or daedatelum), based upon Plateau's phenakistoscope. It was a very crude, mechanical form of a motion picture 'projector' that consisted of a drum that contained a set of still images. When it was turned in a circular fashion, it created the illusion of motion. 1860 The zoetrope, another animation toy, was invented by French inventor Pierre Desvignes. 1872-1878 British photographer Eadweard Muybridge took the first successful photographs of motion, producing his multiple image sequences analyzing human and animal locomotion. California senator Leland Stanford commissioned Muybridge to determine whether the 4 legs of a galloping horse left the ground at the same time, so he set up 24 still cameras along a racetrack. As a horse ran by the cameras, the horse broke strings which were hooked up to each camera's shutter, thereby activating the shutter of each camera, capturing the image and exposing the film. Soon after, the photographs were projected in succession with a viewing device called a Zoogyroscope (aka Zoopraxiscope). Viewing the photos in sequence comprised a primitive movie. 1877 The praxinoscope (which refined the long-established zoetrope with mirrors rather than slots) was invented and patented by the Frenchman Emile Reynaud. In 1892, Reynaud opened his Theatre Optique in Paris with a theatrical form of his 'movie or animation' device designed for public performances. The device reflected out, in long segments, the sequential, hand-painted drawings that were on long broad strips inside the drum. 1882 Etienne Jules Marey in France developed a chronophotographic camera, shaped like a gun and referred to as a "shotgun" camera, that could take twelve successive pictures or images per second. 1886 Pioneering British inventor William Friese-Greene collaborated with John Rudge to make an enhanced magic lantern, one of the earliest motion picture cameras and projectors, termed a Biophantascope, to project photographic plates in rapid succession. He claimed to have sent Thomas Edison (who denied receiving anything) details of his camera designs, but received no replies. In 1890, Friese-Greene received a patent for his 'chronophotographic' camera, capable of taking up to ten photographs per second using perforated celluloid film, but his experiments met with limited success, unlike Edison. However, he became the first man to ever witness moving pictures on a screen. 1887 Nitrate celluloid film (a chemical combination of gun cotton and gum camphor) was invented by American clergyman Hannibal W. Goodwin. 1888 Edison filed his first caveat (a Patent Office document) in which he declared his work on future inventions, anticipating filling out a complete patent application for his Kinetoscope and Kinetograph (a motion picture camera). 1888 George Eastman introduced the lightweight, inexpensive "Kodak" camera, using paper photographic film wound on rollers, and registered the trademarked name Kodak. 1888 The oldest or earliest surviving film (a sensitized 53.9mm (21/8in) wide paper roll recorded on 1885 Eastman Kodak paper-based photographic film), was a short silent (2.11 seconds) titled Roundhay Garden Scene (1888), according to Guinness World Records. It came from the camera of French inventor Louis Aimé Augustin Le Prince. 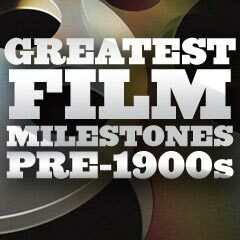 The film was made in mid-October 1888, in the garden of his father-in-law, Joseph Whitley in Roundhay, Leeds, West Yorkshire, UK, shot at 10 to 12 frames per second. However, some sources claim the earliest may be Man Walking Around a Corner (1887), also shot by Le Prince. 1889 Henry Reichenbach developed (and patented) durable and flexible celluloid film strips (or roll film) to be manufactured by the pioneer of photographic equipment, George Eastman, and his Eastman Company.